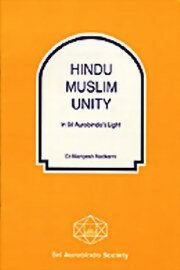 In this talk Dr. Nadkarnin analyses the problem of Hindu-Muslim unity in the light of Sri Aurobindo's thought. Sri Aurobindo did not accept the division of the country as a politically settled fact. In his message on Inida's Independence day he clearly pronounced his views on this issue: "India is free but she has not achieved unity, only a fissured and broken freedom... But the old communal division into Hindu and Muslim seems to have hardened into the figure of a permanent political division of the country. It is to be hoped that the Congress and the nation will not accept the settled fact as for ever settled or as anything more than a temporary expedient. For if it lasts, India may be seriously weakened, even crippled: civil strife may remain always possible, possible even a new invasion and foreign conquest. The partition of the country must go, - it is to be hoped by a slackening of tension, by a progressive understanding of the need of peace and concord, by the constant necessity of common and concentrated action, even of an instrument of union for that purpose. In this way unity may come about under whatever form - the exact form may have a pragmatic but not a fundamental importance. But by whatever menas, the divison must and will go. For without it the destiny of India might be seriously impaired and even frustrated. But that must not be". It is basically in the light of this assurance that Dr. Nadkarni discusses all the converging points of Hindu-Muslim unity taking into consideration the tormented history of both the countries and their religious differences. His thesis makes it possible for the social and political scientists to work in the right direction for this ever elusive unity. In the present-day situation this small booklet assumes a great significance and it is hoped that it will act as a guide for all well-wishers of both the countries who will now forget their differences and political one upmanship and come together in the true spirit of harmony and universal brotherhood.